I had the pleasure of visiting, Burj Khalifa, the world’s tallest building , which stands 2,717 feet (828 m) tall while we were in Dubai. 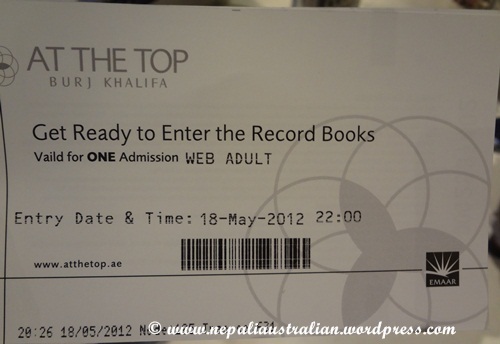 As I mentioned in my previous post, my friend SS and his friend Mr. R dropped us in Dubai Mall around 9.45 pm as we had booked tickets for Burj Khalifa’s Observation Deck for 10pm. 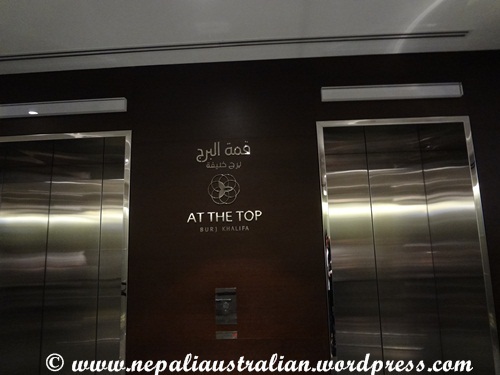 The entrance to the Burj Khalifa is next to The Dubai Mall’s Lower Ground level. 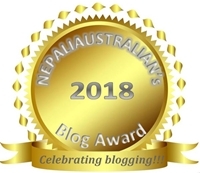 The tickets cost us 100 Dirham (AU$25) as I had bought them online a week ago from Sydney but if you were to buy the tickets on the same day, the price is 400 Dirham (AU$ 100). Our research paid us well :). After handing out the ticket to the lady at the gate, we have to go through a security check and then had to wait for 15 minutes in the lobby. 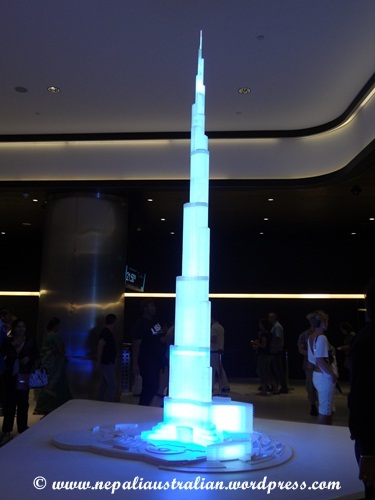 In the lobby there was a replica of the tower made with fibreglass which is illuminated with blue light as well as some history about the tower. 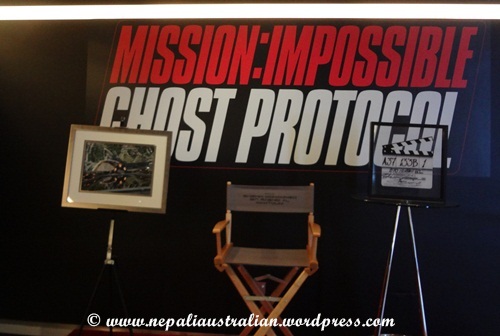 At one corner of the room there were a few items from the movie Mission Impossible, the Ghost Protocol. After a while we were asked to queue up and we caught a lift to the second level. Then we had to take two more escalators before we reached the world’s fastest elevators. Along the way there were information about the building process, the design of the tower etc. and also a couple of models of the building. For the elevator, we needed to queue up and were finally escorted inside the elevator. I was thinking the ride in the elevator would be like one of the rides we get in Disneyland (you know, your body goes up but your stomach seems to have stayed back down at ground level) but to my surprise I didn’t feel a thing. It was quite small (carrying about 14 people) but very fast. 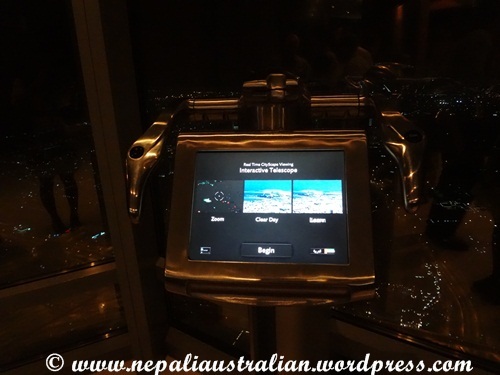 The lift travels at about 18 m/s so it only takes a minute or so to reach the observation deck at the 124th floor (there are still 39 stories above the observation deck). The only indication that the elevator was moving was the indicator on the elevator and the ear pressure you feel as it moves up. Before we left Sydney, I had done some research and found this video on YouTube. So I was expecting something thrilling like that but to my disappointment it was just a floor with glass windows and nothing beyond that is accessible to the public. Now I realise that, the only reason the guys in the video were allowed to go so high was because they were staff members during the filming of the latest Mission Impossible movie (Ghost Protocol). 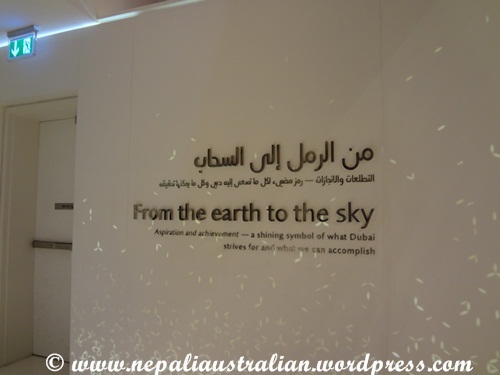 As soon as we got out on to the viewing area I could feel the humid air of Dubai even at 10 in the night. Anyway from the windows we got a great view of the landscape of Dubai, like from a plane. There was light everywhere and I could see the beautiful city. The view is obviously out of this world, truly breathtaking seeing Dubai in the night. We walk around and took heaps of photos. Computerised telescopes which allow visitors to zoom in different streets and buildings of Dubai were placed in different places at the deck. We also saw the musical fountains from the top and it’s great views from different angle. Unlike KLCC tower and other towers I had been to before, you can stay here as long as you wish but there is so much you can see from the top. After almost an hour on the top, we took a lift down. Along this path also, there were information about the building process, the design, history on how the building was built and photos of some people who were part of making this iconic building. Also there were many interactive features like ‘Burj Around the World’ which allow visitors to view Burj Khalifa against the skyline of other famous cities. 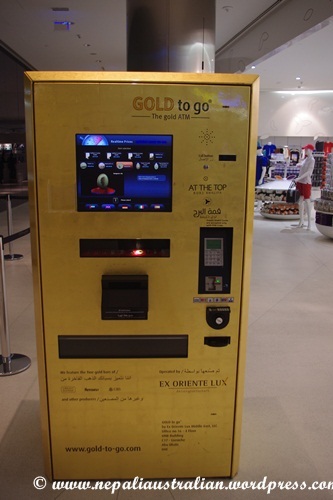 On the way out from the Khalifa, for the first time in my life, we saw a Gold ATM. Of course where else one expect to see a Gold to go ATM that sells 24 carat gold bars or coins at current market prices. It’s updated every ten minutes to stay current with prices on the world gold market. The exterior of the machine is coated with a thin layer of gold and it is very shiny. 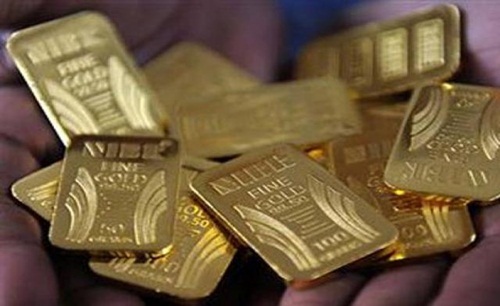 It offers 320 items to choose from, ranging from gold bars that can weigh up to 10 grams, to customised gold coins. Burj Khalifa was known as Burj Dubai but during GFC, Abu Dhabi leader had to bail them out of their debt crisis so they named it Khalifa, in honour of the President of Abu Dhabi, Sheikh Khaifa bin Zayed Al Nahayan. . There are 1,210 fire extinguishers on the site. At peak cooling times, the tower requires approximately 10,000 tonnes of cooling per hour. The tower’s observation deck is located 442 metres above ground, the highest publicly accessible observation deck in the world. Condensation on the building is collected and drained down to a holding tank located in the basement from where it is pumped into the site irrigation system for use on the tower’s landscaped gardens. This system provides about 15 million gallons of supplemental water per year, equivalent to nearly 20 Olympic-sized swimming pools. The amount of steel rebar used for the tower is 31,400 metric tons – laid end to end this would extend over a quarter of the way around the world. Dubai has set a new world record for vertical concrete pumping for a building, by pumping to over 460 metres. The previous record was held by Taipei 101 for pumping concrete up to a height of 448 metres. Burj Khalifa also breaks the world record for altitude transportation of concrete before construction is complete. The total area of cladding used to cover the Burj Khalifa is equivalent to 17 football fields. The concrete used for the Burj Khalifa is equivalent to a solid cube of concrete 61 metres on a side, a sidewalk 1,900 kilometres long, the weight of 100,000 elephants. The tower’s peak electricity demand is estimated at 36MVA, equivalent to roughly 360,000 100-watt light bulbs. 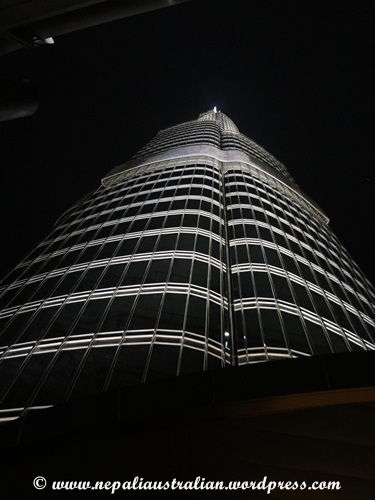 The Burj Khalifa features the world’s first Armani Hotel. Burj Khalifa derives its design inspiration from the desert flower, Hymenocalis, and incorporates patterning systems that are embodied in Islamic architecture. The Burj Khalifa spire is visible from as far away as 95 kms. The total glass requirement is 142K sq/m. The car park has approx. 3,000 parking places in four levels and a total area of just under 89000 m2. 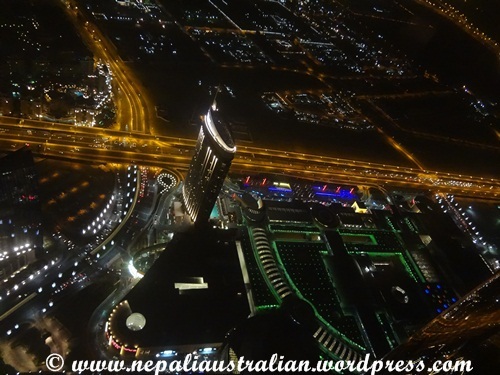 This entry was posted in Travel, UAE and tagged Burj Khalifa, dubai, khalifa, observation deck, world's tallest building. Bookmark the permalink.